Welcome to the CSTART Wiki! The COSMoS Program is focused on design and construction of a family of picosatellites and nanosatellites based on the CubeSat 1U, 2U and 3U specifications. 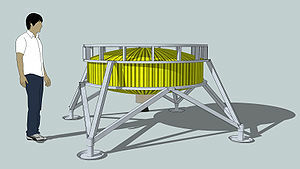 Initial concept render of a general purpose lander. The flat deck on top allows various payloads to be handled including a seat for manned missions. For descent only mission profiles the payload to the lunar surface can be increased over sample return missions. Check out the CSTART image gallery for more pictures. This page was last modified on 27 February 2011, at 03:23. This page has been accessed 45,728 times.